We are happy with our new chairs that arrived last Friday! The chairs are made from scrapwood by Dutch designer Piet Hein Eek. I think they match really well with our living room which used to be a cow stable. The pendant lights are from IKEA and the baby chair is from Stokke. I love the white porcelain teapot which is handmade by Spanish label Sargadelos. 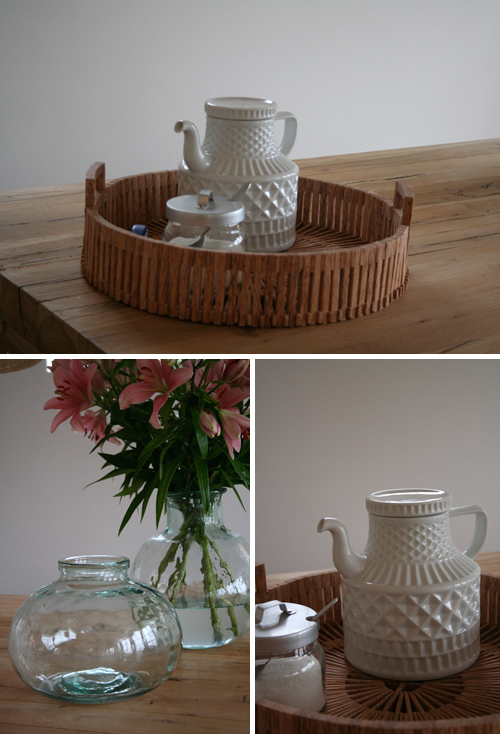 The large vases are from Le Souk, as well is the wooden tray which is also designed by Piet Hein Eek. Love it! It looks fantastic, are they comfortable? What a fabulous room…love it all!! A modern classic twist. I love the clean and fresh touch to this room. grappig, wij wonen ook in een voormalige stal! Ik mis wel een mooi behangetje…..
Wow! These look beautiful and i love that tray as well! congrats because they are gorgeous!!! nothing more exciting than when new stuff arrives! très très jolies chaises… BRAvo Danielle it fits so well by your home!! Very nice these chairs. And I like this very special teapot, looks so great. Hi LeSouk – I just received the tree duvet cover that I ordered, and I love it. Thank you so much. Love this guy!!! He does such a great work!!!! !